We’ve been using CGM in the cloud in the form of Nightscout since September. Last week we started using the new Dexcom Share receiver. – It’s easy. There is really no need to read instructions. If you know how to pair any bluetooth device on your phone, you know how to connect Dexcom Share. I downloaded the proper apps on Caleb’s phone and my phone. I already had the account set up. I waited for the two hour start up period and we were live with Share. (Note: Share is currently only compatible with an iPhone or iPod). It’s light! One receiver and one phone that Caleb carries anyway. No extra things to carry or charge or connect. – It’s basic. 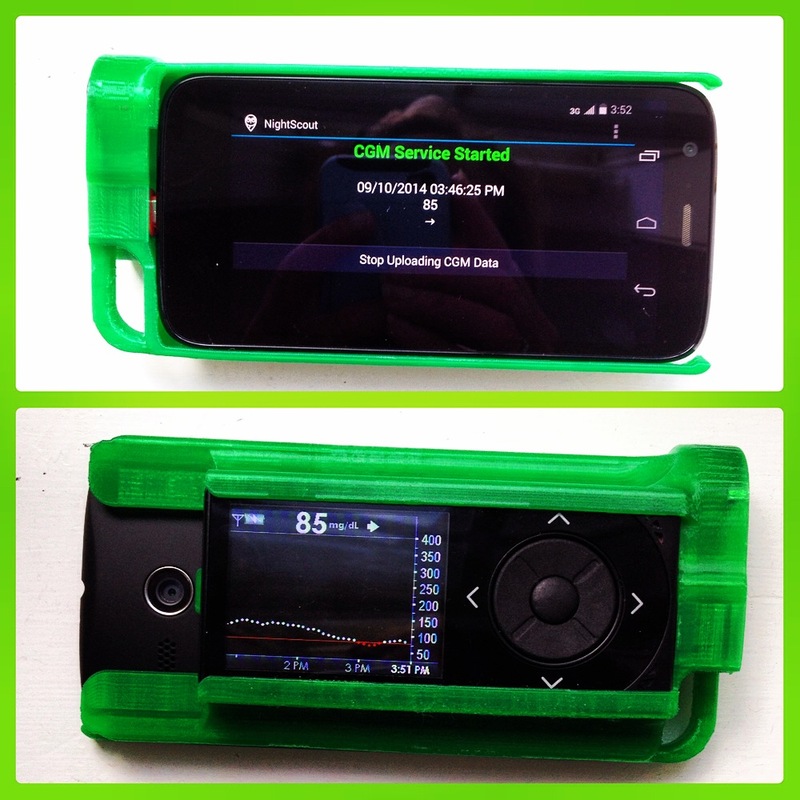 Dexcom Share is very simple: you can see the receiver’s information on your iPhone. It doesn’t matter where the receiver is. If the receiver is in range to the user’s iPhone, the cgm data is pushed to the cloud and anyone who has been invited to see the data, can, no matter where they are. A user can Share data with up to five people. – The alarms are helpful. 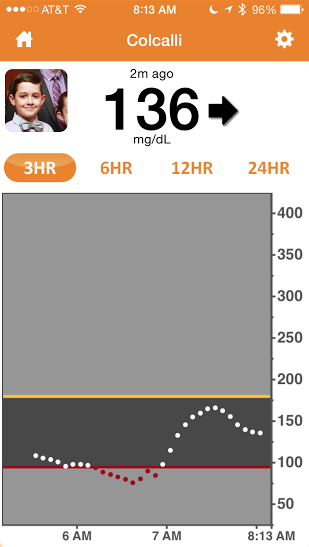 Just like a Dexcom receiver, you can tailor the alerts you get: low, urgent low, high and a new one: no data. I have low set to “Baby Cry.” If I still had babies in the house, I probably wouldn’t find it as cute as I do. 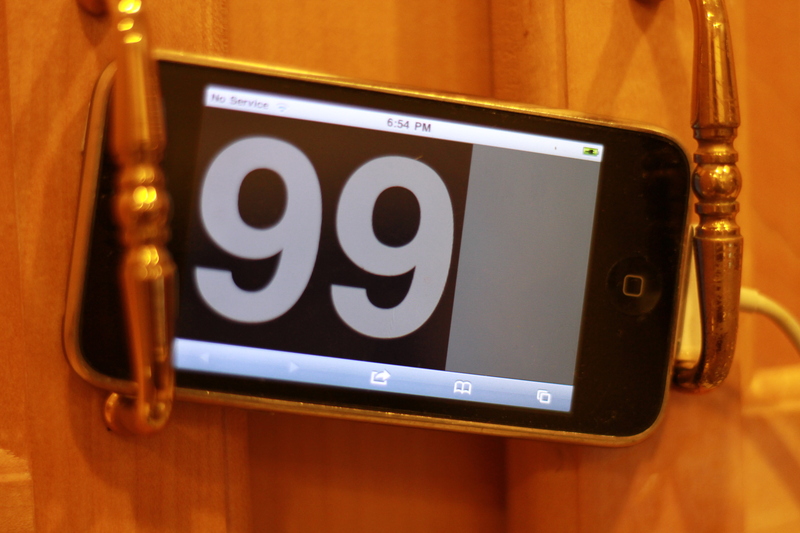 – An active communication tool. The Nightscout Care Portal allows a user to post blood sugars, treatments, meals and any other notes within the graph. It maintains a log of all that activity. This is a good means to communicate with the school nurse while simultaneously building a database of actions. At any time a peek at the Nightscout graph shows calibration dots and dots of actions so everyone is easily fully informed. – A blood sugar status a glance away. Nightscout allows access to cgm data from almost anywhere – a Pebble watch, any computer screen or web browser regardless of what mobile device you use, an old iPhone dedicated to the “clock” version. Access to the graph is unlimited. – Predictive. 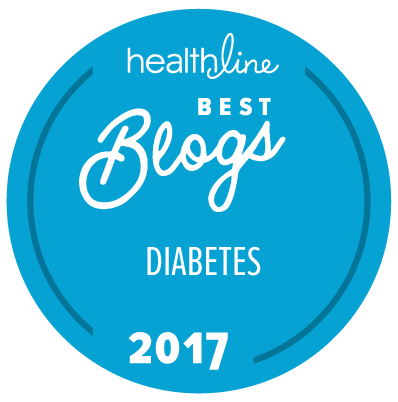 Nightscout has a cone of confidence – the cgm graph extends beyond current data showing a possible rage of future blood sugars based upon the recent trend. – A view behind the ??? and hour glass and start up pie. With the addition of raw data access, Nightscout brought a whole new pool of information to users. No more black out periods, although this information should be used with great caution. Read more about it here. 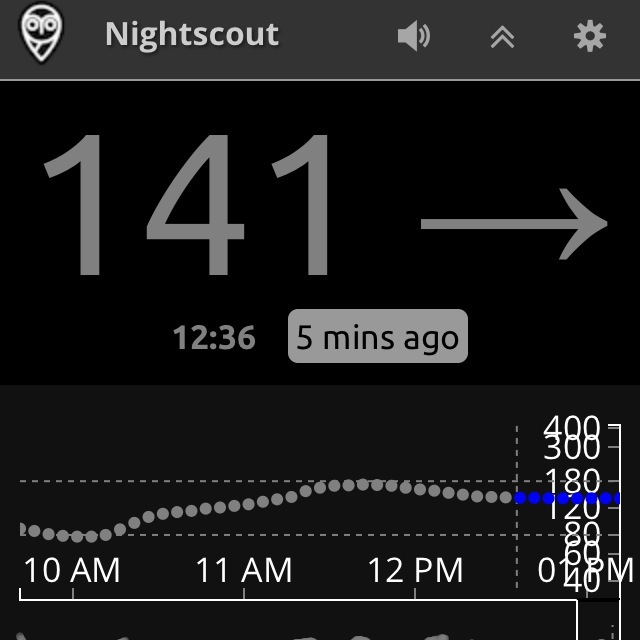 The Nightscout Project is an ever-evolving development of improved access and use of CGM data. Because we are already iPhone users, using Share is simple and the relief of the rig makes sense for us right now. 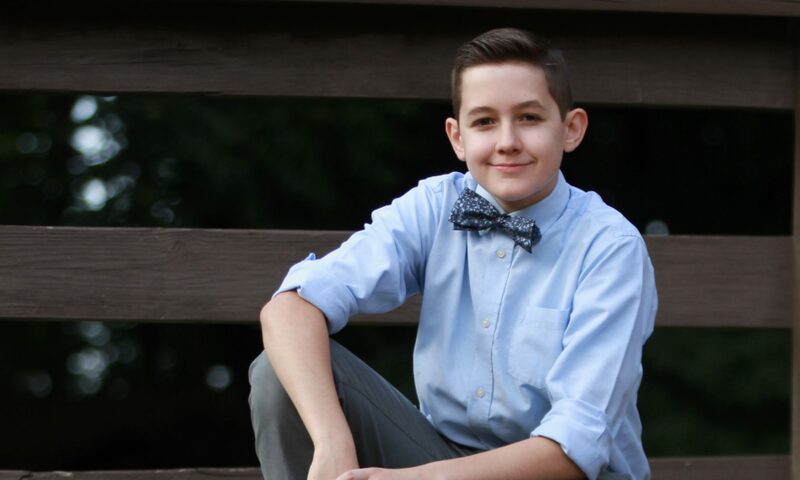 We will continue to incorporate Nightscout into Caleb’s diabetes management as it makes sense and we will continue to watch for developments as The Nightscout Project Team continues to push the envelope making access to these improvements possible for so many. Their work is revolutionary. Fantastic news announced by Dexcom today. Cloud information has been approved for the G4 system. New receivers will be available soon – see below for details. SAN DIEGO, Jan 26, 2015 (BUSINESS WIRE) — DexCom, Inc., DXCM, -0.29% a leader in continuous glucose monitoring (CGM) for patients with diabetes, announced today that it has received U.S. Food and Drug Administration (FDA) approval for its Dexcom G4® PLATINUM Continuous Glucose Monitoring System with Share. The Dexcom Share receiver uses a secure wireless connection via Bluetooth Low Energy (BLE) between a patient’s receiver and an app on the patient’s smartphone to transmit glucose information to apps on the mobile devices of up to five designated recipients, or “followers,” without the need for a dedicated docking cradle. These followers can remotely monitor a patient’s glucose information and receive alert notifications from almost anywhere, initially via their Apple® iPhone® or iPod® touch and in the future on Android devices, giving them peace of mind and reassurance when they are apart. The “Share” and “Follower” apps will be available on the Apple App Store at no charge. The Share receiver is anticipated to ship to new patients in early March 2015. All patients who purchased a Share cradle will receive a free upgrade to the Share receiver. All purchasers of a G4 Platinum receiver from January 1, 2015, until the Share receiver is shipped, will receive a free upgrade to the Share receiver. There will be a low cost cash upgrade to the Share receiver for those patients who are still under warranty with their existing receiver. The Share receiver will be compatible with future generation Dexcom sensor systems. The FDA reviewed the mobile app software used with the Dexcom Share receiver (both the “Share” app on the patient’s phone and the “Follow” app on the caregiver’s phone) through its de novo classification process, a regulatory pathway for low- to moderate-risk medical devices that are novel and not substantially equivalent to any legally marketed device. The FDA has specifically classified the apps which communicate with the Share receiver as a secondary display device and has noted that similar devices which provide only secondary display for passive monitoring, but which do not replace the primary real-time display device, will be subject to the same classification, subject to compliance with certain special controls established by the Agency with respect to this secondary display. This means that devices which comply with appropriate FDA regulations, including the special controls, will not be required to submit a premarket notification to the FDA before marketing a secondary display device for continuous glucose monitoring. The Share receiver was still evaluated as a Class III medical device. Management will hold a conference call to review this approval starting at 9:00 a.m. (Eastern Time) on Monday, January 26, 2015. The conference call will be concurrently webcast. The link to the webcast will be available on the Dexcom website at http://www.dexcom.com by navigating to “Our Company,” then “Investor Relations,” and then “Events and Webcasts,” and will be archived there for future reference. 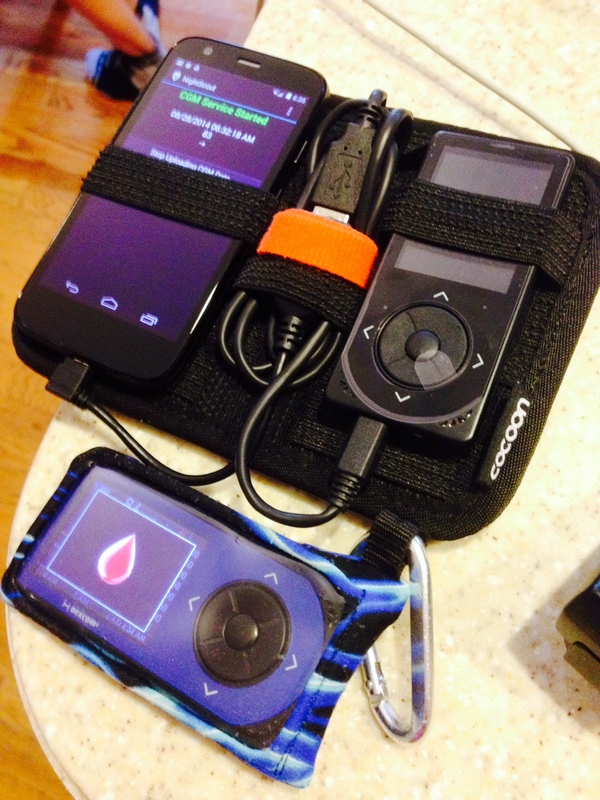 The Grid-It works well for the “rig” (the dexcom and uploader combination that feeds the data to the cloud). It fits precisely in Cal’s CMC Urban Day pack. There is some vulnerability to the DexCom receiver’s usb port. To avoid damage, it’s important to keep the connection of the cable to the receiver immobile and intact. The Grid-It does that well. 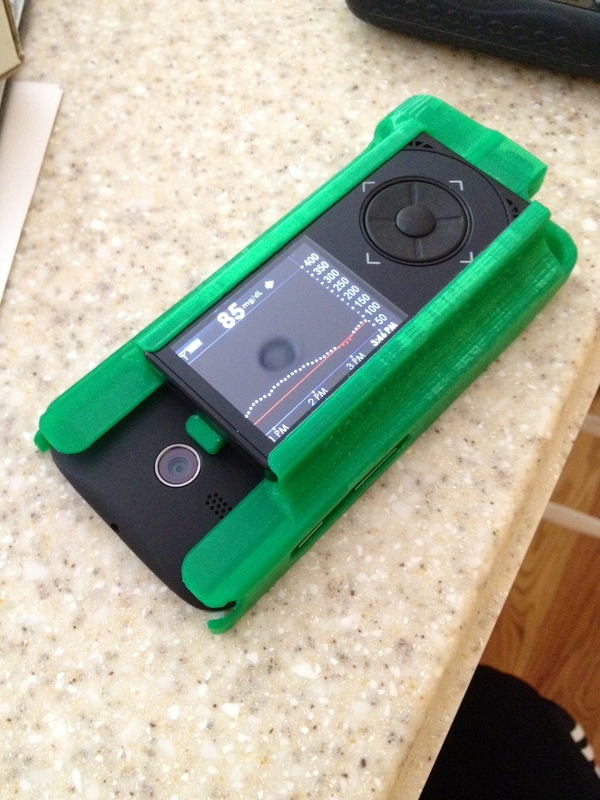 There is a 3D printable case developed by two men who are members of the CGM in the Cloud Facebook group. The case holds the Moto G, the DexCom receiver and a special cable very snugly to limit any movement. You can either buy the case from them or download the file for free to print a case yourself, if you prefer. They also offer a DexCom only case which keeps the cable secure if you are using a different uploader but still want added strength to the DexCom usb connection. I got our case that you see pictured here through a local printer I found on 3D Hubs. The case was $24 and the cable was $26. Everything is snug. Very snug. I’m not sure I’ll ever be taking the receiver out of this case. I am getting used to taking the phone in and out of it to charge. It’s a tighter fit than what is shown on the video. Could be due to the printer, speed of printing or some other 3D print variable I’m not familiar with that results in variability in the product. It’s not l light. So although it can be worn as a lanyard with a case, it might be a little uncomfortable, but people are doing it. The people contributing to this project are simply amazing. Such heart and soul are being given freely to make the lives of people with diabetes better. An update to the NightScout website, called Brownie, was rolled out yesterday. It allows for a Care Portal where care decisions can be documented and shared easily. We started using it this morning. I’ll post more about it soon! This is a picture of Caleb’s real-time pre and post lunch CGM data as I write this post. He is at school. I am at home. In April of 2013 (oh my goodness, I cannot believe it was that long ago) I mentioned DexCom Share with much enthusiasm. There’s a rumor going around that DexCom Share may be nearing FDA approval, but that is just a rumor with no substantiation. I hope we’ll hear something soon. It seems awkward to have a cradle and to connect to this cradle wherever you go and presumably carry this cradle around. But the idea of being able to access the CGM data of a person who is nowhere near you made me giddy. Getting this information in this way has become a reality for hundreds (is it thousands?) of people. It’s not through DexCom Share. It’s though Nightscout, created by a grassroots group of people who realized they had the ability to make this happen themselves. It is not FDA approved or regulated in any way. It is a DIY-at-your-own-risk-open-source situation. Many are making it work and enjoying the benefits despite the risks associated with it being non-regulated. 1. Adding anything additional to Caleb – who I’m sure already feels like a pack mule despite the nifty bags I find – is not appealing in any way. (That whole cradle issue I mention above with regard to DexCom Share). 2. More devices/programs/databases means more opportunity for things to go wrong. We have so many variables and troubleshooting already. The thought of more is less than appealing. 3. 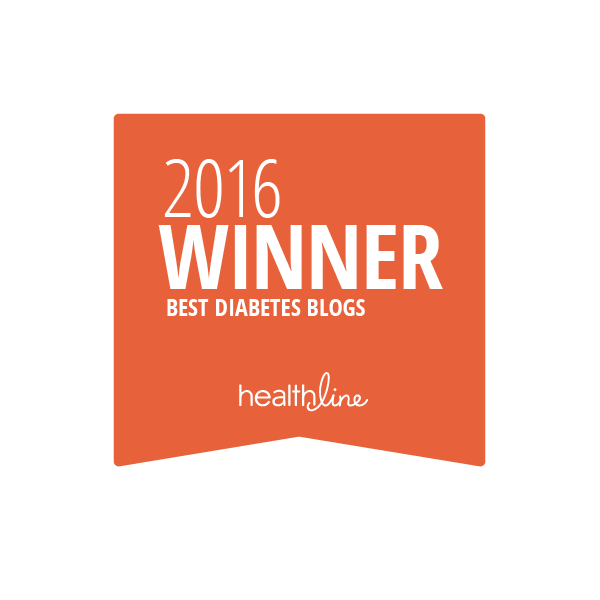 Our goal is to encourage Caleb’s diabetes autonomy. Getting this nonstop flow of data seems like taking the reigns back into my hands, which is in direct opposition to our current goal. 4. This seems COMPLICATED! I don’t have time for complicated right now. No time at all. This remained on my todo list though. 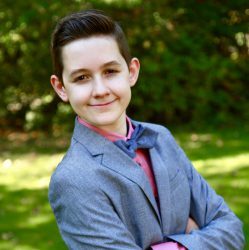 I wanted to learn more and when the summer and many of its activities started coming to a close, I had the opportunity to investigate. By then, people had come up with some clever ways to carry the rig – not as cumbersome as I originally thought. (Ours pictured here on the left). I was seeing people I personally knew putting it into action which made it seem more attainable. When I finally sat down and looked at it, the setup instructions were very well written and although I would still consider it complicated, is was not difficult to get set up, just required a lot of attention to detail. It’s been less than two weeks and we are off to a good start. We got started with the bare essentials for $73 for the whole rig using wifi access. We’ve worked out several kinks, added a data plan for about $9 a month, and are getting this integrated into our regular routine.